The Presidential Inauguration for Rev. 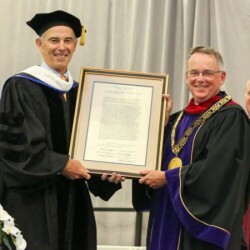 John F. Denning, C.S.C., the tenth President of Stonehill, was held Friday, September 20, 2013 in the College’s Sports Complex. “Now in our 65th year, we are still a relatively young institution and, while we have made major strides forward in that time, I believe that our best years are still ahead of us. I base my confidence on the spirit of dedication I see across our campus and the talented individuals who teach, mentor, and represent the College at all levels,” he said. From 2007 to 2013, Fr. Denning guided Stonehill’s Student Affairs Division, collaborating with others on campus to ensure that a culture of learning permeates all areas of College life. Prior to that, he served as the College’s first Vice President for Mission, establishing that department and launching initiatives to enhance Catholic identity at the College. He began his service at the College in 2000 as its Director of Campus Ministry. Prior to his arrival at Stonehill, Fr. 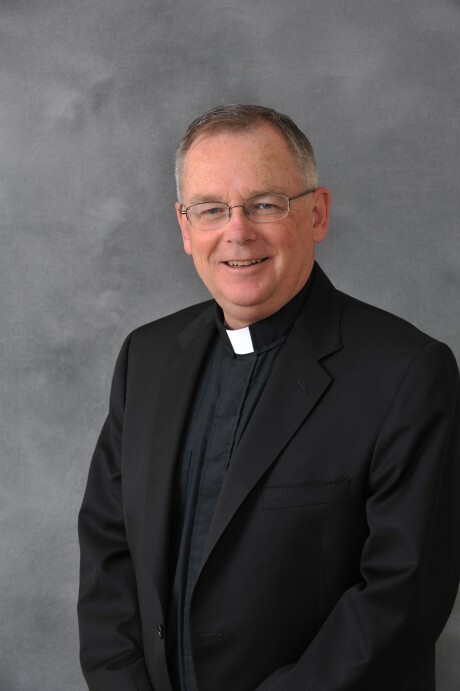 Denning served as campus minister at the Catholic Center at Bridgewater State University; teacher, coach, and chaplain at Coyle & Cassidy High School in Taunton; and vocations director for the Congregation of Holy Cross. He is a trustee of King’s College in Wilkes-Barre, Penn., another Congregation of Holy Cross institution. Also active in local affairs, Fr. Denning serves on the boards of My Brother’s Keeper in Easton and Father Bill’s & MainSpring Coalition for the Homeless in Brockton. Fr. Denning entered the Congregation of Holy Cross in 1983 and was ordained as a Holy Cross priest in 1987. Following in the footsteps of the Congregation’s founder Blessed Basil Moreau, C. S.C., he is an educator in the faith and one of 1,200 Holy Cross religious serving in16 countries and on five continents. The U.S. Province of Priests and Brothers, with which he is affiliated, sponsors three other educational institutions in addition to Stonehill, the University of Notre Dame, the University of Portland and King’s College. A Rhode Island native, he graduated from LaSalle Academy in Providence and received a bachelor of arts degree from Tulane University in New Orleans. He holds a master of divinity degree from the University of St. Michael’s College in the University of Toronto and a doctorate in higher education from the University of Massachusetts Boston. His dissertation research is on student social movements in 1960s, in particular the Young Christian Students.